In July 2013, the City Council voted to make the city’s electricity supply 100% renewable as part of the city’s commitment to carbon neutrality. As a precursor to this decision, the local Department of Utilities first offered a 100% renewable electricity plan. To enroll in the 100% renewable plan, customers agreed to pay a slightly higher electricity rate. In return, the average household that enrolled avoided about 9500 lbs. of CO2 emissions annually, roughly the equivalent of not driving a car for 10 months. Those enrolled were mostly residential customers (95%), with commercial customers making up the rest of the mix. Those who signed up were motivated by a desire to do the right thing and provide role modeling for the next generation. In 2013, the 100% renewable power option was to be entirely supplied by solar RECs. Currently, Palo Alto is powered by two large-scale solar projects and three more were expected to begin operating by 2016. 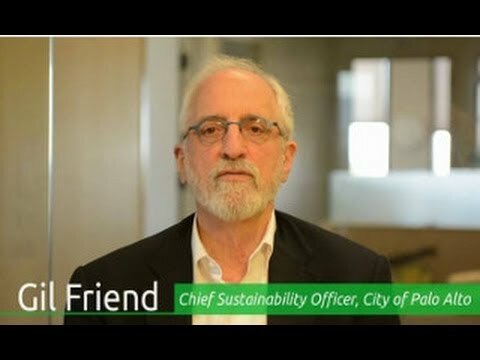 The City Council approved a Carbon Neutral Electric Resource Plan commiting Palo Alto to using carbon neutral electric resources from now on. The Carbon Neutral Plan is designed to be transparent, credible, sustainable, inspirational and repeatable by other communities. In keeping with the City’s efforts to combat climate change, this plan effectively eliminates all greenhouse gas (GHG) emissions from the City’s electric portfolio effective right now. In 2015, the state of California adopted a new Renewable Portfolio Standard (RPS), requiring that all utilities in the state should supply 50% of their retail electric sales from eligible renewable resources by 2030. The city is on track to exceed 50% of the RPS level in 2017. Ranked #3 in the country for the largest percentage of total electric purchases coming from renewable sources. Recently approved power purchase agreements for an additional 185.5 Gigawatt Hours of solar photovoltaic electricity. Near term (2013 through 2016)—the City will purchase short-term renewable resources and/or renewable energy certificates (RECs) to supplement existing and committed long-term renewable and hydroelectric resources, which account for 65% to 83% of the portfolio. Longer term (beyond 2016)—long-term renewable resources will provide about a 50% RPS level within the existing 0.5 ₵/kWh annual RPS rate limit. Since about 50% of the electric supply portfolio is already sourced from carbon-free hydroelectric resources, the additional cost of achieving carbon neutrality between 2017 and 2020 is very small. In 2015, Palo Alto experienced a serious drought. Nevertheless, half of the city´s electric supplies were carbon neutral. By 2012 the City and Community reduced emissions by 5% from 2005 emissions level for a total reduction of 39,702 metric tons of CO2. In recent years the City has taken multiple steps towards reducing GHG emissions in its electric portfolio through energy efficiency efforts, encouragement of solar photovoltaic panel installations, offering PaloAltoGreen, and adoption of an accelerated Renewable Portfolio Standard (RPS). Combined, these efforts are expected to account for an over 40% drop in 2012 electricity-related GHG emissions compared to 2005 levels. In 2016 the City Council approved the Sustainability and Climate Action Plan which continues Palo Alto’s effort to set ambitious goals for the future. The city plans on reducing GHG emissions to 80% below 1990 levels by 2030. In 2015, this reduction was already at an estimated 36%. The city thereby exceeds the goals set by the State of California which plans on achieving the 80% reduction goal by 2050. Watch a fun rap video celebrating this milestone!